I don’t want to go on forever about my kid, so I’m going to close this thread after this post. So, why did I do this? Why did I open up my private struggles for all the world to cringe over? But I knew that I WASN’T alone. I knew there had to be others out there struggling and having no idea where to turn. I’m here telling you that you CAN take your life back. You just need to take that first step, and then dedicate yourself to it. Yes, I used one particular program. I’m not telling anyone to go out and buy the Total Transformation. There are other products out there. Do your research. Pick the one that’s right for you. The big thing is DO SOMETHING NOW. I can’t believe how quickly things changed. It was only a few months ago that I was collapsed of the living room carpet sobbing. It seems like a bad dream now. I’d like to share a picture with you. This was taken when Littlest Dude was 3. He doesn’t even look like this anymore. It’s precious, isn’t it? This picture always made my cry, because I remember this day. 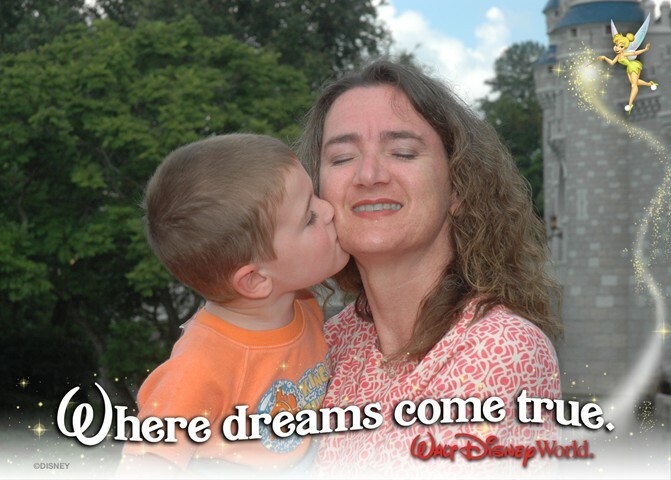 I had taken him so my husband and Dude #1 and Dude #2 could enjoy themselves at Disney World. I sacrificed myself, and I was miserable. I bribed him to stop and take this picture with me, hoping it would be a wonderful memory. Instead when I looked at it on my wall, I knew it was a lie. I don’t look at it as a lie anymore. I look at this picture with a gleam of hope in my heart. I actually have REAL moments like this with my child now. I feel love from him, and that love is returned. I know we will have ups and downs, but doesn’t every family? Normal, for the first time is six years, is in reach. If you have a child with behavioral problems, get help. It will be the greatest gift you’ll ever give your family. This entry was posted in Total Transformation and tagged ADD, ADHD, ADHD In Teenagers, Behavior, Child, dealing with behavior problems, Diagnostic and Statistical Manual of Mental Disorders, Family, Mental Health, Toddler, total tranformation, Walt Disney World. Bookmark the permalink. Thanks. He’s grown leaps and bounds. Oh, I got tears reading your post! So proud of you. Thank you for sharing your journey with us! Too many people are running around in circles with no hope things will ever change, and I’m positive you helped to give some people hope through your posts. I’m so glad you found some balance, where just enough change was more than sufficient. When we put family first, the next step along our life path to happiness becomes clearer 🙂 HUGS! You should almost put that last sentence all in capital letters. I don’t know how many people bump along, hoping for the best. I love how you started soon, are honest with yourself (and with all of us), and are pounding it out, one day by one day. Congratulations, and thank you. No…. Thank YOU Guys for listening! Cheaper than psychotherapy! Bittersweet. You and family have come to a good place with the little ones. I nod my head, silently acknowledging “This is good. This is very good.” I discovered your blog late, and so I haven’t tracked with you and your journey that long. It has been good. My 16 year-old Aspergers guy, who is manic most of the time, has the emotional age of 5. Cognitively, he is somewhere between 10 & 12, fortunately. Our story is not very similar to your story, but it has been encouraging and helpful to read about success that other parents are experiencing. We are at a fork in the road, our family. Something has to change. I think God’s sense of humor is at play, here: I have been a psychotherapist for 15-plus years, and a chunk of that time was with high-risk youth. I can work with other kids. But when it’s my son? Different story. Signing off, now; please accept my apology for a long reply and some pathetic melancholy. Our boy is a good boy. I’m just empty, for now. Keep writing. I understand feeling empty. You have so much love and so much frustration at the same time. Good vibes are coming at you from cyberspace. I hope you can key in on the good times. Best if luck to you! I think sharing this was great and took a lot. I have a VERY active toddler who I pray will learn to listen and settle down as she grows, but for now I have to deal with rude people in stores telling me I am a bad parent. I am glad there are those that stuck with you and you made it! I am also glad there are programs that worked for you. What a sweet post. Just be sure to keep all your materials close at hand, because adolescence can turn everything upside down. I’ll be thinking of you and hoping that your little dude comes shining through. Best of wishes that the future holds wonderful experiences for everyone in your family and as a family! I don’t think anyone here cringed. I think our hearts opened and we sent lots’a interwebz lovin’ your way. Thanks for inviting us in. … oh my! Those fishies look a little peaked, dont’cha think? I’ll … erm … be right back. I got a little choked up reading this, which is not a small thing for me. I’m so impressed you stuck with the program, and I’m happy to learn more about another option for parents who struggle with behavior-strong children. We still struggle from time to time- but now we are not helpless. A happy future is definitely in sight. It’s heartwarming to hear you are all on your way to a better life and understanding. Your little guy will grow up great. You’ll see. This was such a beautiful and heartfelt thread. I, like my pal, Jilanne, am delighted to hear that you and yours have turned a corner. Thanks so much. Give your kid a hug for me 🙂 everyone deserves a great relationship with their child. I totally sympathise with you. My son had behavioural problems pretty much from day 1, went from cranky tired baby to demanding toddler to tantrum throwing teenager to..well, odd adult, I guess, but he’s turned out mostly lovely with spots of totally weird. Some nights I just used to cry. I’m so glad you managed to turn things around. Congratulations! I love stories with happy endings. :o) Especially when they’re true. It must feel so awesome to have that image match reality now. Awesome and a huge relief.